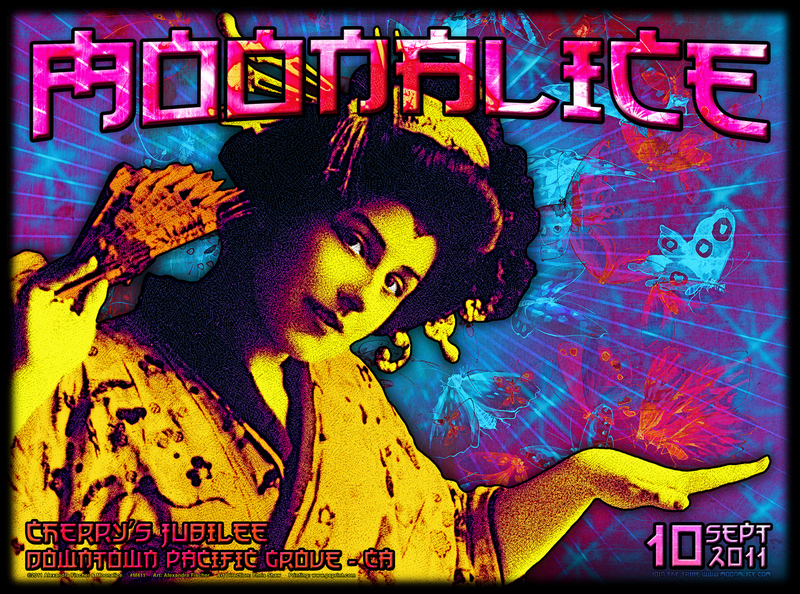 According to Moonalice legend, today’s poster by Alexandra Fischer depicts Cherry Jubilee Moonalice, a matriarch who hailed from here in Pacific Grove. Cherry’s first career was as a pastry chef, where her pioneering work with flaming desserts came to an untimely end when the restaurant burned to the ground. That’s when Cherry turned her attention to hot rods. She specialized in Funny Car drag racing, using a unique hemp/alcohol fuel to blow the competition away. Thank you to Mayor Carmelita Garcia, the city council, the chamber of commerce and the people of Pacific Grove!!! Scott Blair filled in for Paul as guitar tech! I had to leave at the "break" so had the show playing on the Droid all the way home, or all the way to Morgan Hill, anyway! Wondering if there is a way to turn off the picture though as active video doesn't mix well with driving! The setting for this show was fantastic. The main street in Pacific Grove is a boulevard that was filled with antique cars, hot rods and other fun modes of transit. Our stage was in a parking lot next to the Bank of America, with space for 300 or so right in front of us. Because our stage faced the boulevard, there were also hundreds of people listening to the show while they fantasized about running away in one of the roadsters!! Big Steve for BoA prez!!! Great job by Glenn and the MobileRider team to get this show posted so quickly. They also got rid of all the pre-roll so the show starts right away with Mayor Garcia and Big Steve! !